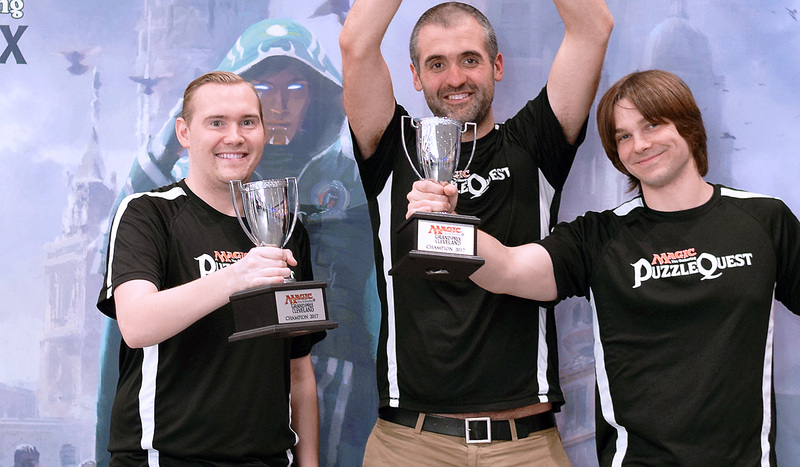 More than 500 teams and 1,600 players came to Ohio to compete in Grand Prix Cleveland, from locals playing in their first Grand Prix to the best in the world. That included legends Jon Finkel and Kai Budde, as well as a collection of the top-ranked players in the world. With so many teams competing, it was anyone’s tournament. At least, that’s what everyone who wasn’t the Peach Garden Oath thought. The superteam of Hall of Famers William “Huey” Jensen and fifth-ranked Owen Turtenwald, along third-ranked Reid Duke, was widely considered the best team in the world entering the tournament, and they showed why in Cleveland. Their Top 4 run began with a victory over Nathan Smith, Brandon Ayers and John Rolf in the first team draft, before running into the buzzsaw team of the weekend in Nakamura, Burkhart and Juza, who had cleanly dispatched Josh Sellers, Nick Neill and Chris Ferber on the other side of the bracket. That set up an epic finals, and one that either team could win. But would you really expect anyone other than the superstar trio to come out on top? As Jensen used Drake Haven to fly over the top for the final win of the tournament, to no one’s surprise it was once again the Peach Garden Oath that walked away with the title. Grand Prix Cleveland began with more than 500 teams, but after nine rounds of play exactly one stands on top. That would be Oliver Tiu, Shahar Shenhar, and Ivan Floch, who came together as a team as a matter of convenience but are leaving Day One of the event next to each other at the top. Not far behind them lurk a pool of superstars, including the Peach Garden Oath, who are at 8-1 after narrowly losing to the team ahead of them in the final round. Also at 8-1 are Corey Burkhart, Shuhei Nakamura, and Martin Jůza, as well as Paul Reitzl, Matt Sperling, and Dave Williams. Just over 100 teams will return on Sunday to battle it out for a shot at the Top 4 in Amonkhet's final bow before the release of Hour of Devastation. Five more rounds of Sealed will take us to the final four, who will then draft for a shot at the title and the trophy. Tune in to Twitch.tv/Magic to watch it all unfold. The hashtag for Grand Prix Cleveland is #GPCleveland. Join the conversation!